We are not long for Mali. Every day our options for exploring the country shrink and I feel more confined. This is such an unfortunate circumstance…no visiting villages, no travel South, no music, a feeling that we can go no where outside the city without the minute chance of being abducted or put in harms way. The funny thing is that you would never know what is happening by sitting in the mango grove and having tea until someone tells you that there are check points on every bridge to make sure that dangerous people don’t enter the city. Ironically, we have heard that the only arms being seized are leaving the city, not entering it. I guess that should make us feel a little more secure. 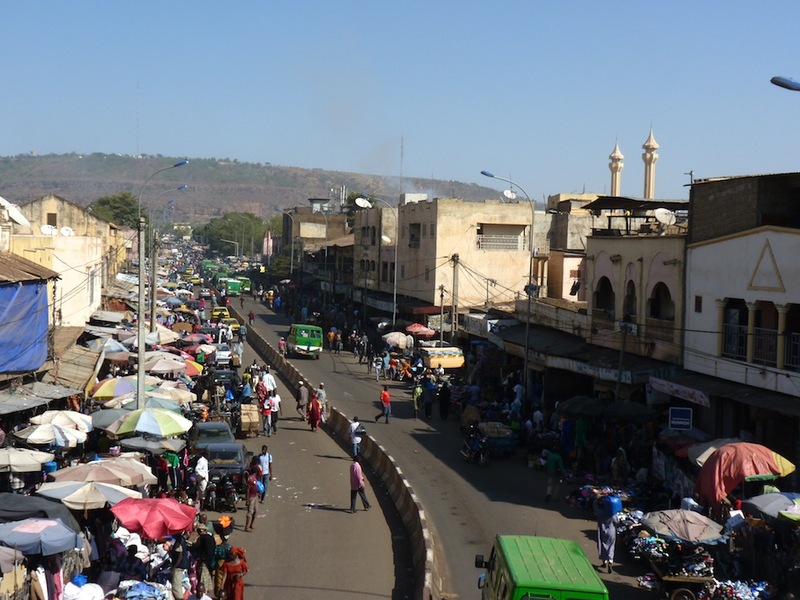 I think we could stay in Bamako for quite some time and never be in danger, but I’m starting to ask myself if there are greener pastures elsewhere. Jess and I are still enjoying the food, which gets cooked for us every day (thanks Salli) for like $4. I am really enjoying the national dish of Mali, cheb, which is a rice dish with veg and some meat or fish. I have had one alcoholic beverage here (Flag, the most common beer here, which taste pretty much like every countries most common beer; inoffensive and easy to drink) and have had no want for another; people just don’t drink here and I don’t miss it. I’ll save the drinking for Europe. We went to the grand market on Monday, which was pretty cool. We went to the actual practical market and also the artist market. While the regular market was a little slow, the artisanal market was absolutely dead. We were told that we were the first tourists there in over 6 months, and the desperation was palpable. Every seller would tell us that “looking is free” and they will make us “best price”, then throw everything they could at us. Jess and I very much overpaid for some items (gifts for family) and felt pretty good about it. It was pretty sad, but even when sellers did not close the deal with us they were gracious and wished us well. Luckily, by the market was a pharmacy where I bought ibuprofen. I have had ongoing problems with my feet: First they cracked and bled, then I got some kind of heat blisters trying to wear shoes to protect the cracks which quickly burst and left open sores, then I tripped and bruised my right foot. Ironically, the plantar fasciitis I suffer from is nearly none existent here. I’ve actually run out of band-aids trying to cover the sores so that the swarms of flies don’t get them infected…really annoying. At least I’m toughening up my feet! I can only imagine that we will leave in the next couple of days unless a compelling reason to stay presents itself. This is definitely not the way I wanted to see Mali, but I am still really glad we came here.